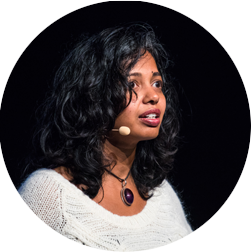 Indu Alagarsamy is a distributed systems specialist and has over 15 years of software development experience. She is currently part of the development team at Particular Software, the makers of NServiceBus, practicing her passion. Indu is also passionate about diversity and inclusiveness in the tech industry. When not programming, she is either rock climbing in sunny Southern California or spending time with her kids and her chill giant dog! Domain Driven Design and Messaging go hand in hand, like a warm chocolate brownie paired with vanilla ice-cream! DDD is a software discipline that allows you to move faster and write high-quality code. The whole point is to align the software you write to be flexible with the business changes. When you start to use the technology of messaging to communicate between clean and well-defined bounded contexts you get to remove temporal coupling. And voila, you now have microservices that are built for autonomy from the ground up. Sounds perfect? In this talk, discover this intersection of DDD as a software discipline with messaging as a technology counterpart. Build reliable systems that can scale with the business changes.